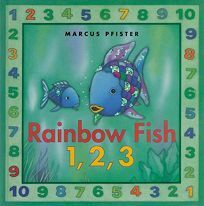 Fans of Marcus Pfister's Rainbow Fish will welcome Rainbow Fish A,B,C, in which the fellow invites youngsters to his underwater school: ""Come for a swim in the deep blue sea,/ and learn the alphabet with me!"" Throughout, large alphabet letters float across otherwise wordless spreads, in order, until youngsters reach Z: ""Now you've learned your ABCs./ You're as clever as can be."" Rainbow Fish 1,2,3 encourages more interaction, as the hero asks children to count his different colored scales (""How many yellow scales does Rainbow Fish have?"") and various sea creatures on each page.